Zombies roamed the streets of Elizabethtown, KY on September 27-29, during Night Risers, a film festival and expo presented by Izzy’s Little Creepers. While the zombie walk wasn't new, the film festival and expo was. There’s always a risk when embarking on a new venture. Will people show up? Will the event go without any hitches? Will the vendors be happy and willing to return? I can’t speak for anyone else, but I have to give kudos to organizers, John Thompsett and Terri Pfeiffer for organizing a well-run expo. They and the staff were knowledgeable and friendly, and the overall atmosphere was positive. Unless I have a scheduling conflict, I plan to return next year. There were only two authors, me and L. Andrew Cooper. Although we weren't scheduled to, Andrew talked to John, and he let us read from our stories. Andrew read from his novel, Burning the Middle Ground (BlackWyrm Publishing) and I read from my published short stories, “Family Tradition” and “It’s in Your Blood” (Bites - Ten Tales of Vampires). 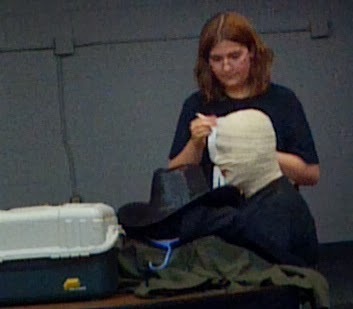 Entertainment included “Darshwood, the Conjuror Magic Show,” a “Brain Eating Contest,” and “MakeOff!” (a make-up artist turned her subject into the Invisible Man). I had an oracle reading. The intuitive confirmed something I’d suspected, and told me I needed to be more confident and meditate more. I also had my aura photographed. Without going into detail, I’m happy to say my aura is balanced, and I’m a creative/artistic person. Like the intuitive, the aura reader said I needed to meditate more, among other suggestions.